If you haven’t read my profile for Pure Nintendo, The Legend of Zelda is my favorite franchise in gaming. It’s a series that makes me feel accomplished when solving its puzzles, traversing its dungeons and saving the land of Hyrule. I’ve saved Hyrule and its inhabitants by traveling through light and dark worlds, across a vast ocean and even through time itself. No challenge seemed impossible or daunting…that was until I came across what is known as the black sheep of the Zelda franchise and no I’m not talking about the CDI games. To me those never existed and I’m happy with that. It’s time to take Zelda in a different direction full of strong RPG elements and side scrolling. 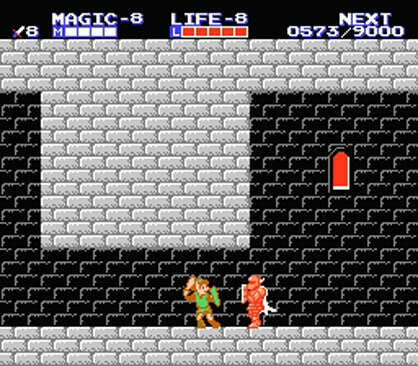 This is Zelda 2: The Adventure of Link. 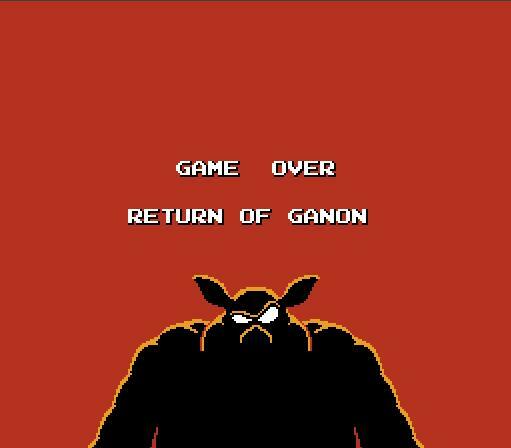 Our story begins a few years after the first Zelda title, where while Ganon has been defeated, Hyrule has seen better days. Old followers of Ganon have been running amuck looking to revive their dark master. How you may ask? By spilling the blood of Link on his ashes. Kinda gruesome for Nintendo standards, but hey, it was the late 80’s. To top it off, Zelda has also been cursed and is stuck in an eternal sleep. Legend then predicts that Link must prove himself to the gods and obtain the Triforce of Courage by defeating the seven palaces in order to save Zelda and once again restore peace to Hyrule. No one said being a hero was easy and this game is anything but easy. Right off the bat, Zelda veterans are presented by something completely different. Gone is the birds eye view gameplay from the first Zelda and is now replaced with a side-scrolling perspective much like that of Super Mario Bros. I cant begin to express how puzzled I was when first introduced to this, but like a good gamer, I learned to adapt and quickly. When it comes to control, you pretty much have two buttons that you need to worry about, jump and attack. Our hero could now jump to higher ledges, avoid or dish out some attacks to nearby foes. Speaking of enemies, the only way to encounter them, other than a cave or a palace, is via the world map. When on the world map, things look very reminiscent of Final Fantasy. One pixelated character in a vast pixelated world. When venturing off the main road, enemies will appear and will attempt to hit you, taking you to the battle screen. Once at the battle screen you have the option to either rid the area of surrounding enemies, or simply exit the screen to continue your quest. Defeating enemies will grant Link some experience points, which after sometime, can be cashed into upgrading his attack strength, overall health or magic. While this is an interesting element especially for something like the Legend of Zelda, it feels like a double-edged sword to me. While I do feel like I’m growing as a player, this then turns into tedious grinding in order to defeat the next challenge ahead which in turns breaks the pacing of the game. However the sensation of defeating enemies in fewer hits is very rewarding, just be prepared to grind for those higher levels. Unlike the previous title, there really aren’t any equipable items for Link, i.e. the boomerang, bow & arrow, bombs, etc. Instead, you’ll find non-equipable that for the majority of the game, are used on the world map. Items such as the magic hammer are used to destroy boulders, the magic flute to find secrets and so forth. While there is an absence of traditional items, Link has a few new tricks up his sleeve. Link can cast spells that will grant specific abilities to aid him in battle, which depending on said spell, will use up your magic meter. Throughout Hyrule are local towns such as Rauru, Ruto, Saria, Mido and more that contain an elder that can teach Link new spells usually after a small side quest. Those town names sound familiar to anyone? So thats the gameplay in a Deku nutshell. Usually this is the part where I’d say “It’s easy to pick up and play”, but I’ll be honest with you, this game will test you. While after sometime it may seem simple, it does have its fair share of problems that seem to be a mix of poor game design and overall challenge. 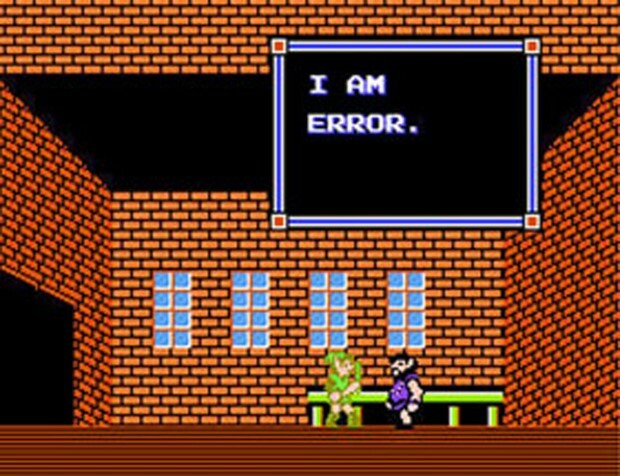 I am Error, In More Ways Than One. Earlier I mentioned how this game has a very strong RPG sense to it and thats not just with leveling up via experience points. If you want any idea on where to advance within the game, you’re gonna have to talk to the townsfolk. Granted they have text boxes that move at the speed of Castlevania 2 Simon’s Quest, some can provide hints on where to advance the game. And just like Simon’s Quest, the responses from townsfolk can prove cryptic at times so be prepared to head online for a guide. Spell casting is another big issue I have with this game. Your spells are your “go-to” items to make sure you don’t get a Game Over thus causing the return of Ganon. Now don’t get me wrong, they’ve saved me from certain doom countless times, its just the way spell casting works in this game that bothers me. For example, lets say you enter a room and cast both shield and jump. You’ve cleared the rooms obstacles or maybe, the room had no obstacles to begin with, so you move on. The second you enter a new room, the spells wear off and you have to recast it again causing you to use up all of your magic. There were so many times where I would need to cast my shield magic for a boss fight only to run out of magic due to this recasting issue. It would have made more sense for Link to find another tunic or a power ring, like in the previous title, to permanently increase his defense or maybe have spells work for a certain amount of time before recasting. But thats just me. 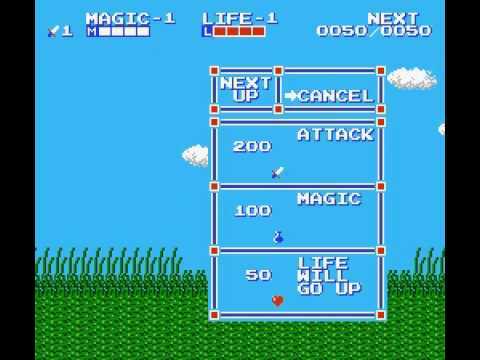 At least the magic meter replenishes when you lose a life and yes you read that right, Link has lives this time around. You can collect them throughout hidden areas of Hyrule or in some palaces and trust me, you’re gonna need as many as you can get. Whenever you run out of lives, you don’t start at the beginning of the palace, instead, you’re taken back to the very beginning of the game with all of your experience points gone. This right here is absolutely infuriating but you do get to keep all the spells, items and upgrades that you’ve collected. I know this is an NES game and games back then punished you for mistakes, but this is a bit overkill. Lastly, the palaces and the lack of maps. There are really only two objectives when exploring a new palace. Find the hidden treasure and defeat the boss. Plain and simple right? Well, it would be, if you actually knew where you were going. While I can see and respect the idea that this gives the player a sense of adventure, it can also lead them to a quick game over as some rooms are complete dead ends full of horrendous obstacles. One does not realize the value of a map, until they get a game over. But while this particular Zelda title seems unforgiving, it is beatable. You could almost say this is a trial and error type game. Eventually you’ll understand each palace and the tricks that lay within as well as the best time to cast each spell to better conserve your magic. 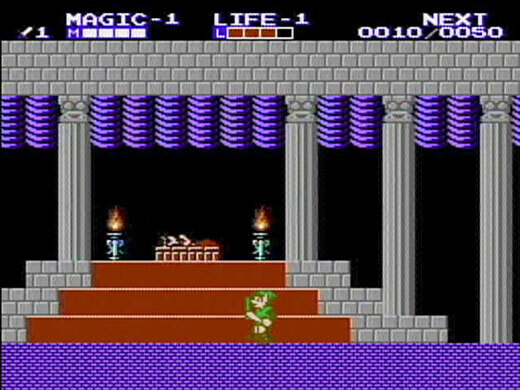 I will definitely say that defeating the boss of each palace does feel very rewarding and the music when you get to the Great Palace? Head over to YouTube sometime and give it a listen. If there’s one thing I love about a games soundtrack, is when the music perfectly accents that you’re at the final stage of your quest. In the end, is this a bad game? No. Is this a great game? Not really. Is this a flawed game? Yes. There were too many problems that out-weighed the good in this case but I can respect Nintendo’s decision to try something different with their beloved IP. In fact, I wouldn’t mind seeing another Zelda game done in the same style, as long as they fix the lingering issues that were previously mentioned throughout this review. 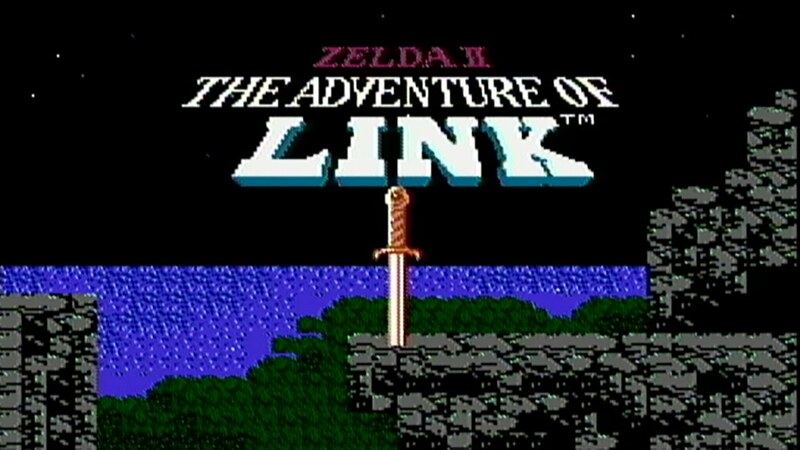 You can pick up Zelda 2: The Adventure of Link for the Nintendo 3DS and Wii U for $4.99. And don’t feel guilty about using the save state feature. You’re gonna need it.